The Computational and Biological Vision Group, led by Hüseyin Boyacı and Katja Doerschner is part of Aysel Sabuncu Brain Research Center and National Magnetic Resonance Research Center (UMRAM), and operates jointly with the Department of Psychology and the Neuroscience Graduate Program, Bilkent University. Research in the lab is focused on visual perception and its neuronal underpinnings. We use behavioral experimentation, neuroimaging (fMRI), and computational modeling to find answers to problems of vision science. Here you can find out more about our projects. Görkem Er successfully defended his Master’s thesis! 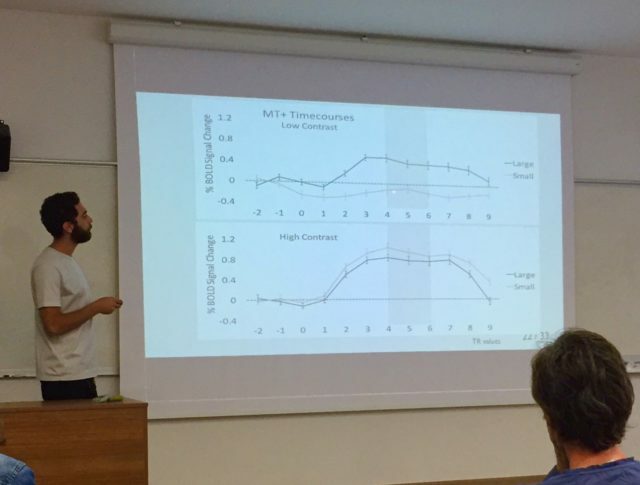 Gorkem defended his thesis entitled “The Role of Contrast and Size in Motion Perception: Behavioral and Neuroimaging Study of Center-Surround Interactions in Primary Visual Cortex (V1) and Middle Temporal Area (MT+) ” on September 13, 2018 at Aysel Sabuncu Brain Research Center. Please follow this link to see the abstract. We wish him good luck in his career! Zahide Pamir successfully defended her PhD thesis! Zahide defended her PhD thesis entitled “The Effect of Context-dependent Lightness on Contrast Detection and Identification, and Its Neural Correlates” on 19 October, 2017 at Aysel Sabuncu Brain Research Center. Please click here for the abstract. We wish her all the best and success in her future career! CBVG was at ECVP 2017! We as CBVG presented our work at ECVP 2017, Berlin. Please visit: http://vision.bilkent.edu.tr/publications/ for more information about our abstracts.